They got jobs but no appraisal. US unemployment rate and wage growth. The US unemployment rate is steadily decreasing after recession. 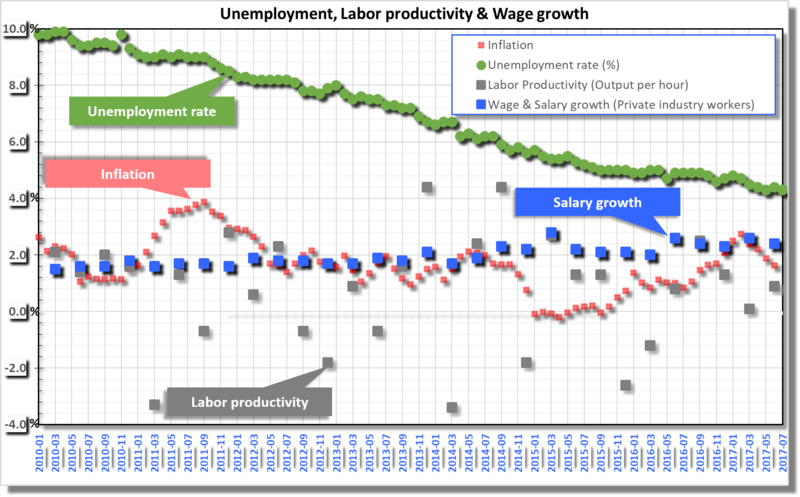 With labor productivity (output per hour) is more or less steady, the tighter jobs market should force employers to compete for workers reflecting in a wage & salary growth. However, that’s clearly not happening. In past seven years, US workers have effectively not seen any raise as the inflation has eaten into whatever growth they saw. Data from Bureau of Labor Statistics.